'After the Hun's shell has fulfilled its frightful destiny, and the army medical attendant attached to the unit has done all he possibly can for his wounded comrade, the patient is placed on a stretcher, if he is unable to walk, and conveyed to the Field Dressing Station. He is then again attended to, the stretcher is placed on wheels, and he is taken to the ambulance on his way to the Casualty Clearing Station'. 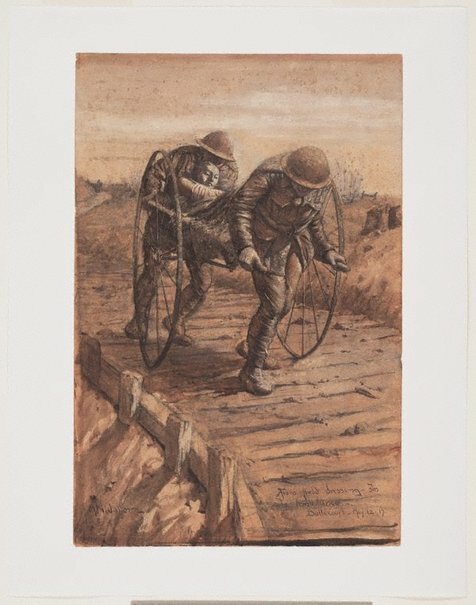 This drawing is essentially a self-portrait projecting Waller's own horrific experience when he suffered life-changing injuries on 12 May 1917 during the 2nd Battle of Bullecourt, which claimed over 7000 Australian's lives. Signed l.l., brown ink "M.Napier Waller". Dated l.r., brown ink "... May 12 17. ".